The Sandbox Evolution not only lets you play God, but also allows you to make your own retro style games right on your smartphone screen. And if you are bored crafting worlds and building games, then there’s always the “Pixel Art” section where you can create pixilated masterpieces. There are also lots of things to do, including completing missions to get mana, completing fun tutorials to know more about the game and trying your hand at making music, another amazing thing about new and improved world creation game. Choose “Water” from the list of “Basic” elements. Add water by swiping right or left. Every swipe adds a layer of water. Swipe left or right to add a layer of stone. The stone mixes with water to create sand. You can always remove extra layer of stone using the eraser and let sandy part remain as it is. The eraser can be extremely helpful in removing excess parts of solid or liquid material (like water) or can help you sculpt a newly created object in the shape you want. Just make sure you have pinched-out to zoom in so that you can erase pixels of an object or element and get the shape of your choice. Now try to create a block of sand using water, stone and eraser. I am sure you will be able to do it. Tip: You can also use metal to create a block of sand. You will have to create an empty container using metal and pour water in it. You can then add stone on the water. Make sure you change the pixel size after selecting an element via Options menu. For making a metal container you can choose small or the smallest pixel size. You can create wet sand by mixing sand (unlock it by spending Mana) with water. You can change the pen size in case you want to draw a frame and later fill the frame with the same element. Try to make a mountain using wall. Select Wall from basic elements and then go to Options (Paintbrush icon). You can see different sizes just below tools like paintbrush, fill, pencil pickaxe etc. Select the smallest size. Now draw an outline of a mountain. Next go to options, select a large pen size and then select the fill tool. Tap inside the wall mountain outline. You can also create containers using metals, but make sure you select a smaller pixel. 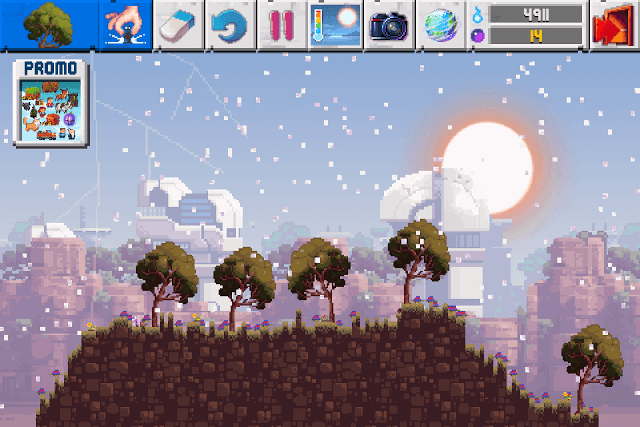 The Eraser tool can very helpful in creating worlds, pixel art or games. You can remove unwanted or excess pixels using it. To accurately remove pixels you don’t want, pinch out to zoom-in. Make sure you have zoomed in so that the pixel looks like a big square. Now select the eraser and tap it to remove it. When you zoom in, you can also easily remove a line of pixels in one swipe. You can also use pickaxe, but with an eraser you can remove pixels from any part of an object without leaving any marks or extra pixels. Pickaxe should be used to create tunnels or dig holes. You can use Metal to make an empty square container. Metal can be accessed via “Basic” elements section. You can create a small container by drawing one if you want to make a small ice block. Use a stylus to draw a metal container. Use eraser to remove unwanted pixels if the container hasn’t been perfectly drawn. Don’t forget to pinch-out to zoom while making one. Next pour some water on the container by swiping on top of it. Fill it up to the brim. Now go to Options to change the “Temperature”. The Options icon is located at the top of the screen to the left of “Camera” icon. Now try filling water on a square metal frame using the “Fill” tool and change the temperature to Very Cold. You can find Fill in the Tools section (paintbrush icon). 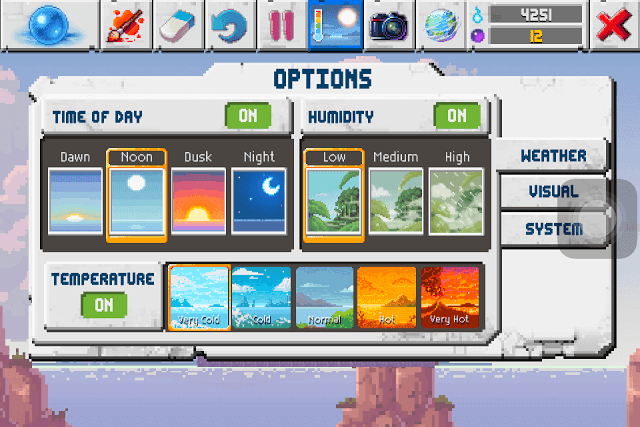 You can also choose “Very Cold”, under Temperature (Options) select Water and swipe. Ice particles will fall on the ground. You can create a mountain made of ice or an ice slab. Tip: Use the Pickaxe tool to break unwanted pixels. To create a snowfall, go to weather options and change humidity to “High”. Go back to your world to see rainfall. Now go to weather options once again, turn on Temperature and then Select “Very Cold”. Close options. Congratulations, you have created a snowfall. Alternatively you can create an instant one-time snowfall by turning water into steam and steam into ice. Select water from basic elements and add it to your world. Next, go to “Options” and select “Very Hot” under temperature. Water will instantly turn into steam. Now quickly go to Options and select Very Cold before water evaporates. Steam will turn into ice. You will be able to see falling ice, which will give an impression of a snowfall. Create a sand block inside an empty metal container by pouring water and then stone inside it. This will create a block of sand. Make sure you pinch out to zoom in and then create a metal container. Now select Very Hot under “Temperature”. Sand will turn into glass. You can then select Normal temperature. You can remove the metal container using pickaxe or eraser. Alternatively, you can unlock sand using mana, add sand to the container and then select Very Hot to turn it into glass. You can also trap steam inside a closed metal container. Select metal and draw a metal square anywhere on the world. Select the Fill tool in the Tools section, select Water and tap inside the metal frame to fill it with water. Now select Too Hot and the water will be turned into Steam. To create lava, select Stone and make any structure. Now go to temperature and select Very Hot. Stone will turn into Lava. Tap the “Missions” icon on the Home screen. There you will find a variety of missions. Earn mana completing missions. Missions could be as simple as adding 5 Bats in Create mode, but there were be certain missions that can be quite a challenge. Tap the “Play” icon and complete Daily Quests. The Quest box usually contains up to 3 player-created mini-games and completing them will give you mana. The harder the game, the more mana a player will get as rewards after completing it. New levels arrive every day. Complete all tutorials to earn plenty of mana. Start with the Genesis campaign, and then complete Pixel Art campaign and finally the Sandmix Vol. 1 tutorial. You will have to spend some mana to unlock the last two campaigns, but you will earn more than what you have spent for unlocking them. You may also earn some Karma once you complete a tutorial. Complete the Caveman level to get 13K mana. But you will need 10 purple karma (purple colored gems) to unlock it. Keep completing other tutorials and you might receive karma or two or watch a 30-second video to get one free. The video option can be seen at the bottom-left corner of the home screen. 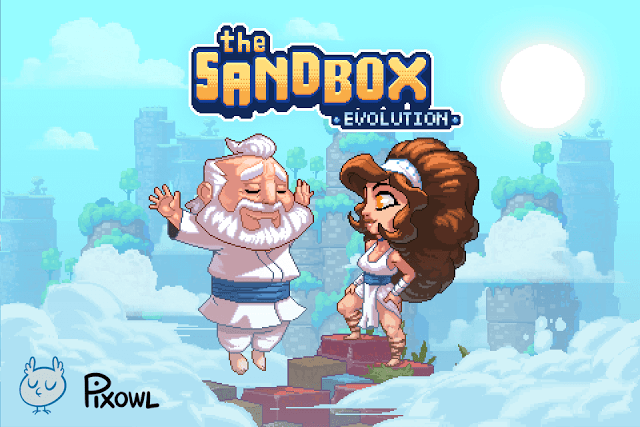 Open The Sandbox Evolution game every day and get Daily Bonus. You will earn a random reward, which could be anything ranging from mana to karma. You may also get new elements, plants and animals. Select Soil from Basic Elements and add soil by swiping the screen. Now select a tree under “Natural” and drop a seed on it. It won’t grow into a tree. What you can do is add water to make the tree grow. Or select “High” humidity to make it rain and the tree will appear at the spot where the seed was dropped. Soil when combined with water turns into mud. When mud is created, you can see all sorts of tiny plants and mushrooms on it. You can zoom in to see them appear and they look wonderful.